Polycystic ovarian syndrome, PCOS, is a hormone imbalance that may cause a woman’s ovaries to malfunction. It triggers a surplus of androgens. DFW Center for Fertility & IVF treats women with this reproductive disorder in Allen, TX. In many PCOS cases, ovaries may get enlarged and covered with tiny, fluid-filled cysts. The cysts are not harmful but may contribute to hormone imbalance and irregular ovulation, or even a lack of ovulation. These symptoms affect about 1 out of every 10 women during their reproductive years, causing women with PCOS to struggle with anovulation and female infertility. Blood tests done in our fertility lab can be used to confirm the identification and to determine the course of fertility treatments. You may also have a pelvic ultrasound to look for ovarian cysts, but an ultrasound is typically not valuable for making any kind of prognosis. 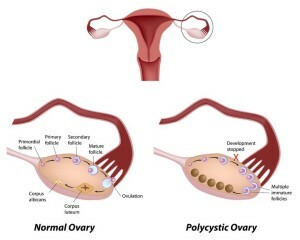 The infertility rate with polycystic ovaries is very high. Women diagnosed with PCOS usually have difficulty with natural pregnancy. Some ovulate occasionally, but others do not ovulate at all, so women with polycystic ovary syndrome usually require ovulation induction to get pregnant. The likelihood of getting pregnant with polycystic ovarian syndrome using fertility treatments is actually quite good. For young women under the age 35 with polycystic ovaries, it’s just a matter of which treatment will be most effective. Set up a fertility evaluation with our Allen fertility clinic in order to find out if you have polycystic ovarian syndrome. Contact us online or call 469-854-0305.